Touch up 236ml tins are available for hiding smaller blemishes. Or, completely re-colour your stove using the 400ml aerosol cans. The aerosols give better coverage and a smoother finish – ideal for larger areas. There are 3 choices of black available both in a touch up 236ml tin, and a 400ml aerosol can. There are over 30 different colours available in 400ml aerosol. So you are sure to find a colour to match your requirements. Larger liquid drums are available in certain colours for industrial application. 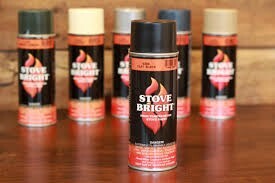 stove bright high temperature paints can give your stove a new lease of life! Where you can purchase paint and accessories for delivery to your home.